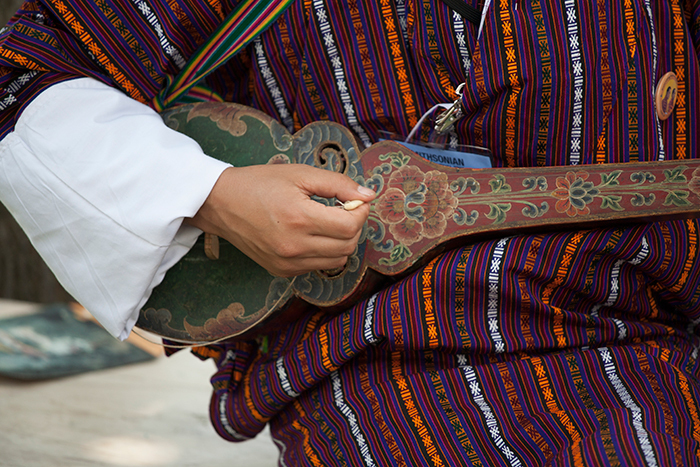 Sonam Dorji plays traditional Bhutanese music on the dranyen for visitors at the 2008 Smithsonian Folklife Festival. Center for Folklife and Cultural Heritage, Smithsonian Institution, July 6, 2008. Photograph by Neil Greentree, Freer and Sackler Galleries. Courtesy of the Ralph Rinzler Folklife Archives and Collections. 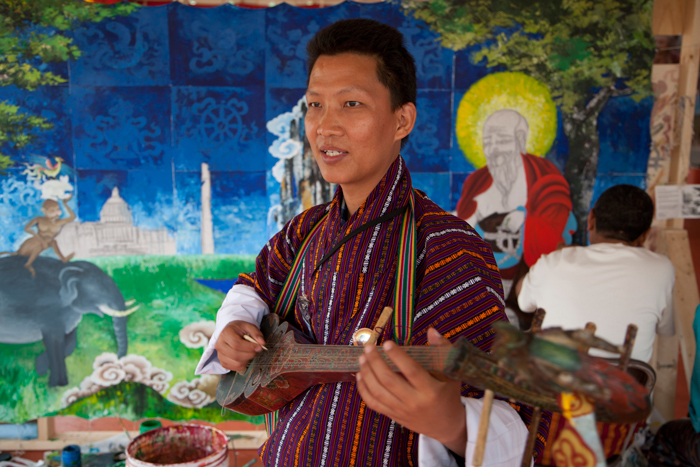 Sonam Dorji, a musician and presenter with the Bhutan program, performs outside the Layap yak tent at the 2008 Smithsonian Folklife Festival. Center for Folklife and Cultural Heritage, Smithsonian Institution, June 25, 2008. Photograph by Robert Harrell. Courtesy of the Ralph Rinzler Folklife Archives and Collections. 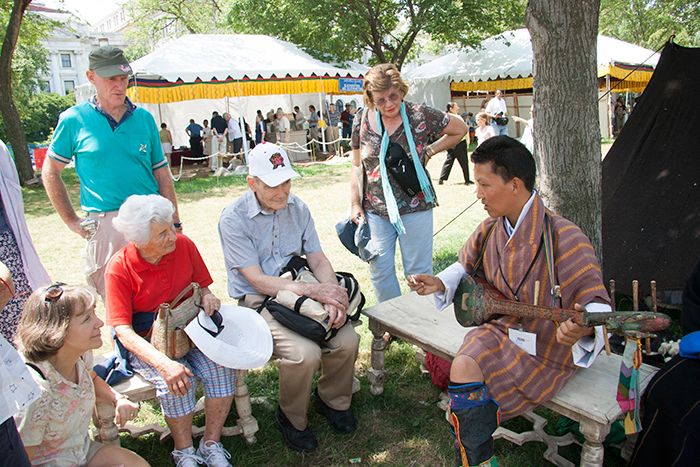 Sonam Dorji performs the dranyen for visitors at the 2008 Smithsonain Folklife Festival. Center for Folklife and Cultural Heritage, Smithsonian Institution, June 27, 2008. Photograph by Marianne Zweig. Courtesy of the Ralph Rinzler Folklife Archives and Collections. 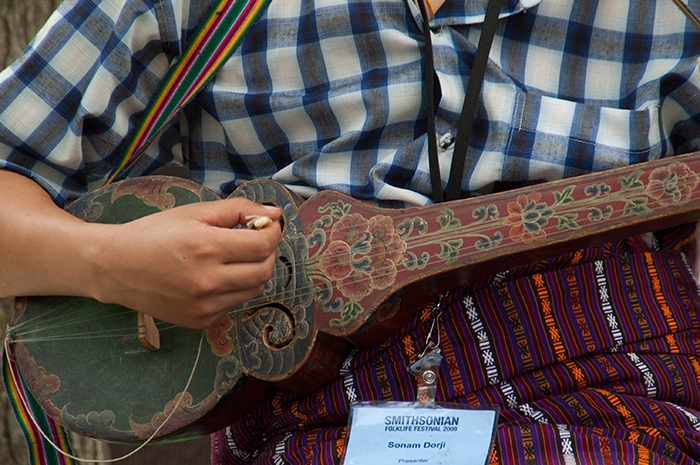 Sonam Dorji plays the dranyen at the Bhutan program site during the 2008 Smithsonian Folklife Festival. Center for Folklife and Cultural Heritage, Smithsonian Institution, July 7, 2008. Photograph by Amulya Mandava. Courtesy of the Ralph Rinzler Folklife Archives and Collections. 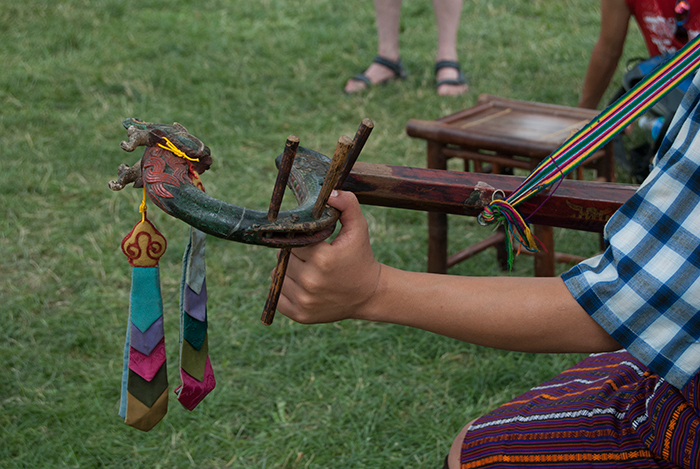 Sonam Dorji plays traditional Bhutanese music on the dranyen for visitors at the 2008 Smithsonian Folklife Festival. Center for Folklife and Cultural Heritage, Smithsonian Institution, June 27, 2008. Photograph by Joe Furgal. Courtesy of the Ralph Rinzler Archives and Collections. 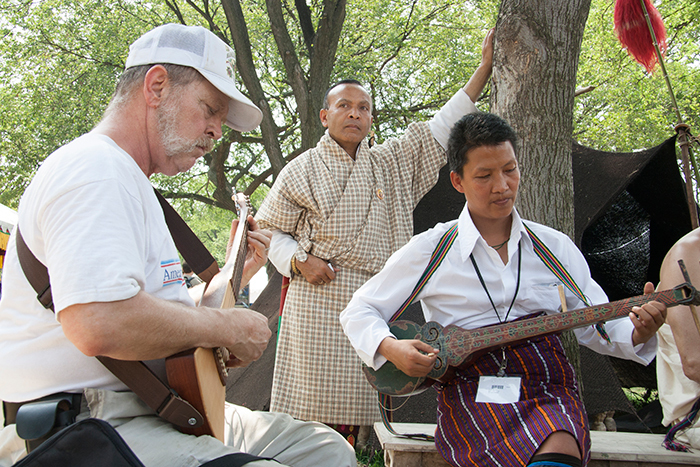 Sonam Dorji plays music on the dranyen with a visitor at the 2008 Smithsonian Folklife Festival. Center for Folklife and Cultural Heritage, Smithsonian Institution, July 6, 2008. Photograph by Amulya Mandava. Courtesy of the Ralph Rinzler Archives and Collections. 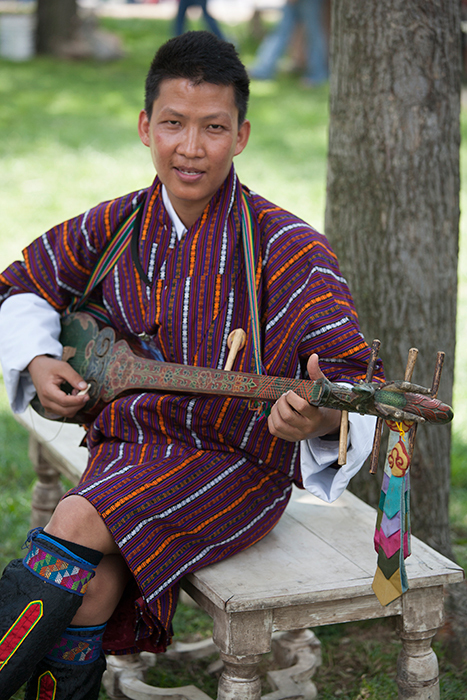 Sonam Dorji, a musician and presenter with the Bhutan program, performs outside the Layap yak tent at the 2008 Smithsonian Folklife Festival. Center for Folklife and Cultural Heritage, Smithsonian Institution, June 25, 2008. Photograph by Robert Harrell. Courtesy of the Ralph Rinzler Archives and Collections. 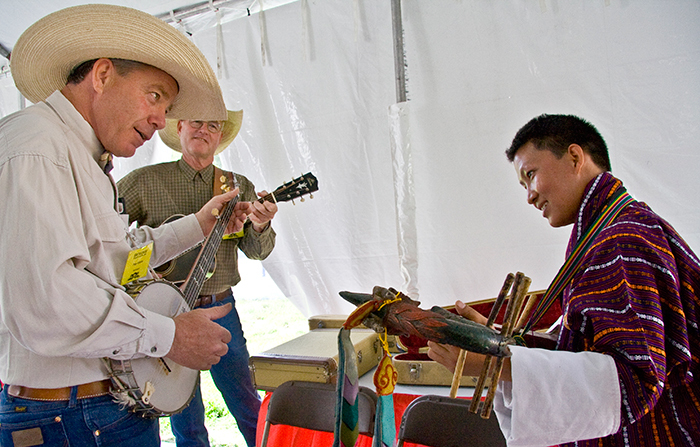 Pipp Gillette, a banjo player from the Texas program, and Sonam Darji, a dranyen player from the Bhutan program, compare instruments backstage prior to the opening ceremony of the 2008 Smithsonian Festival. Center for Folklife and Cultural Heritage, Smithsonian Institution, June 25, 2008. Photograph by Penelope Morgan. Courtesy of the Ralph Rinzler Archives and Collections. 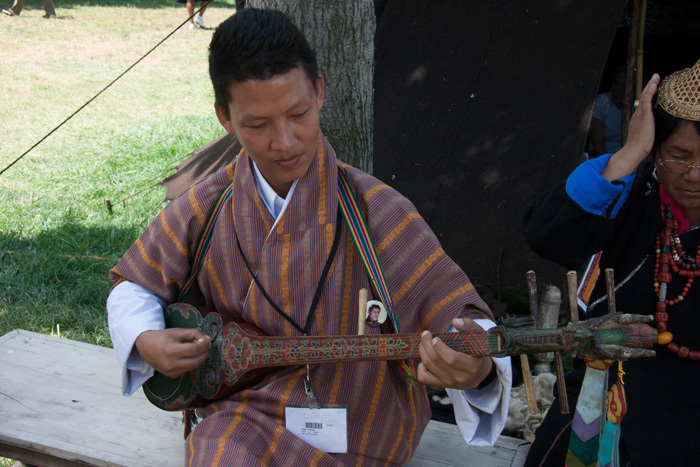 Sonam Dorji plays the dranyen at the Bhutan program site during the 2008 Smithsonian Folklife Festival. Center for Folklife and Cultural Heritage, Smithsonian Institution, July 2, 2008. Photograph by Amulya Mandava. Courtesy of the Ralph Rinzler Archives and Collections. 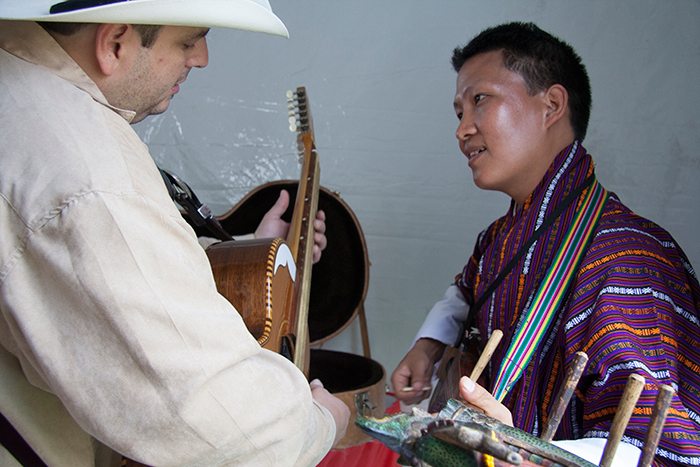 Dranyen player Sonam Dorji, from Bhutan, talks with Max Baca of Los Texmaniacs backstage before the Opening Ceremony of the 2008 Smithsonian Folklife Festival. Center for Folklife and Cultural Heritage, Smithsonian Institution, June 25, 2008. Photograph by Penelope Morgan. Courtesy of the Ralph Rinzler Archives and Collections.